Busts of two angels most likely come from the tracery lights of an English parish church. 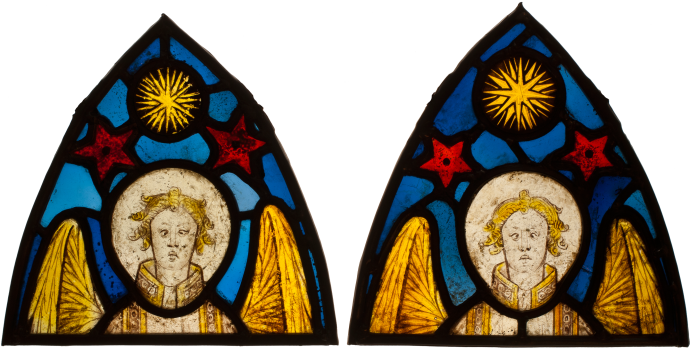 The rather quirky faces of the two angels with delicately drawn features in a number of smalls lines, the rounded eyes and freely drawn hair are all characteristic of a style of glass painting which has been associated with the work of John Thornton of Coventry who was active in York but whose work can be found in the Middlelands and other parts of England as well. The closest parallels are angels from Chalgrouve in Oxfordshire and Saint Michael’s in Coventry however comparisons may also be made with glass made between c.1410 and c. 1440 in York.